Total confession here. I have a crush on those adorable yellow minions. How can you not be in love with their humor, goof-ups and adorable accents? I know my boys feel the same way! To get psyched for the newest Minion movie, let’s get our creativity going with these fun minion crafts for kids. It’s time for a new Minion craze! With the new movie coming out, your kids will be all about Minions, so now’s the perfect time to find some fun crafts to do together. Here are 15 easy crafts the whole family will enjoy. Before you get up to your elbows in crafts, be sure to check out the unbelievably adorable minion gifts I found for my own boys! Get kids into reading with this irresistible Minion Bookmark. Turn an ordinary pair of 3-D glasses into Minion goggles. They’re perfect for seeing the new movie on the big screen! No 3-D glasses on hand? No problem! Try a pair of no-sew felt Minion goggles instead. Remember cootie catchers from elementary school? Try the Minion version! You probably have all the materials you need to make this adorable Minion toilet paper roll craft. 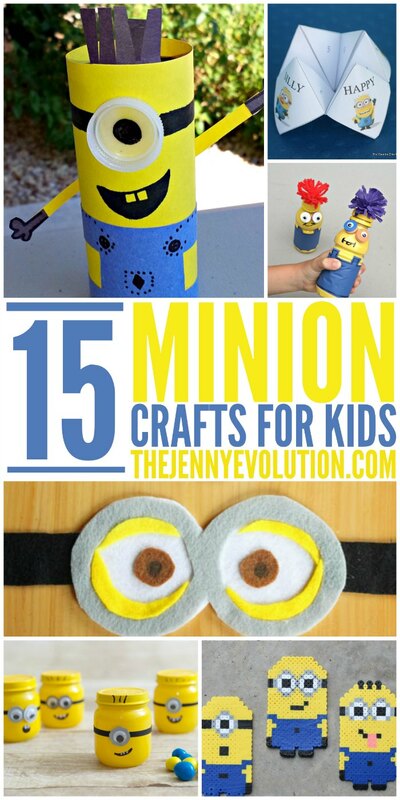 Find instructions here on how to make the evil Minions out of toilet paper tubes, too. If you still have plastic eggs lying around, use the yellow and blue ones to create some easy peasy Minion eggs. Practice your fine motor skills by making Perler bead Minions. Upcycle your juice bottles with some yellow paint and embellishments to make your own Minion. The kids would have a blast making their own Minion snack buckets. If you don’t mind the mess, these Minion sweetcorn shooters could be loads of fun. These Minion party favor jars are easy enough for kids, and larger jars would make terrific pencil or crayon holders. Use plastic jars if you’re concerned about your children dropping them. Spruce up your patio with Minion planters made from peanut butter jars. Minion swaps are so fun! With pom poms, pipe cleaners, some googly eyes and glue, you can make these little creatures, too! Make a Minion footprint family after you watch the movie together! Rescue the Minions from ice. Great activity if you have lots of minion figures! If you haven’t seen the trailer for the newest movie, you’re in for a real treat! 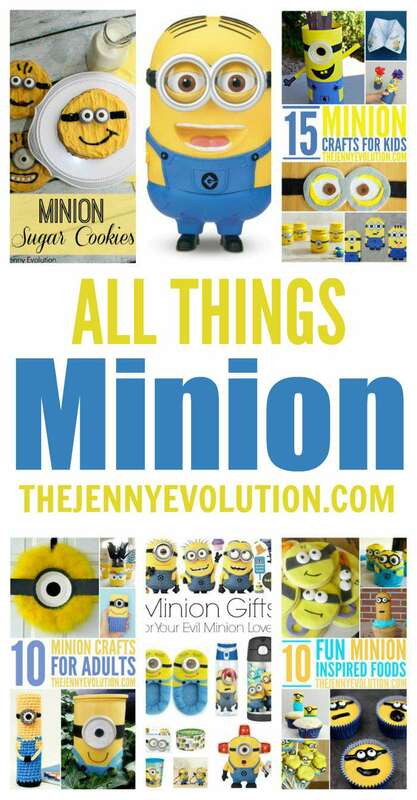 Thank you so much for including my Upcycled Make a Minion craft in this fun roundup! Thanks for including my Minion swap! It is all about Minions around my house these days… my kids are anxiously awaiting the new movie!! thanks for including my felt glasses, what a fun round up!! We are so excited and Minion crazy this summer! My boys are ALL about the minions right now, too. Somehow, I have managed to avoid getting them the fart gun — but I think their father will change that. Ha! I’m totally in love with minions too!! These are such cute craft ideas, I’m going to have to get crafty and make something! Love all the minion ideas. Did you see the dachshunds dressed as minions? It is adorable.